Richard Edward Dziklinski Sr., 91 of Westland, Michigan, passed away peacefully, February 24, 2017. Richard was born in Hamtramck, Michigan on June 3, 1925. Richard is survived by his son Richard E. Dziklinski Jr. and his wife Tina of Livonia, Michigan. His Daughter June Walatkiewicz and her husband Lawrence of Troy, Michigan. Six grandchildren, Richard E. Dziklinski III, Christopher and Amy Dziklinski, Brandon Dziklinski, Megan and Jamie Hyland, Christina Walatkiewicz and Jonathan and Jacylyn Walatkiewicz. His brother Alexander Dziklinski, his sister, Doloras (Walter) Adamczyk. He has two great grandchildren. Eric and Andrew Dziklinski. Many nieces and nephews and extended family. He is preceded in death by his parents, Alexander and Aniela Dziklinski, his brother Arthur Dziklinski. His wife Christine (Cutshaw) Dziklinski and Irene Gorman. Richard loved the Deaf Community. He was recently honored as a 74 year member of Detroit Association of the Deaf. Deaf club helped him find his identity as a Deaf man. Richard loved to tease. No one gets away from his teasing, family, friends, doctors, nurses and especially his caregivers. Sharon Hardenburgh and Mary Ann Melody. They were big part of his care during the past 5 years. We are grateful for their care of our father. 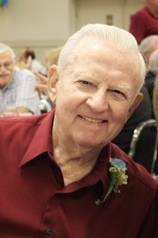 Richard enjoyed going to the Deaf Club, sports, bowling, watching baseball and football and especially playing cards and going to the casino. He had great personal values. He had strong work ethic. He never missed a days work in 25 years. Memorial contributions may be made to St. John Deaf Center, 16103 Chesterfield Ave, Easpointe, Michigan 48021. A memorial Mass will be held at Our Lady of Loretto on Saturday, March 18th at 11am. Our Lady of Loretto is located at 17116 Olympia, Redford Twp, MI 48240. At the north east corner of 6 mile and Beech Daly roads.